Though like many gardeners in the Deep South I grow leaf vegetables and greens (the latter distinguished as pot vegetables) during our mild winters as much for their beauty as for their taste—the lemon-yellow spikes of bolting mustard and collard provide luminous company for spring dandelions and daffodils in this part of the world—Swiss chard, despite its bold greens and reds, rarely finds a space on the street corner, so I was delighted when my buddy D.J. Baker brought me two beautiful bunches of chard this past weekend. “Let me know what you do with them,” he said. 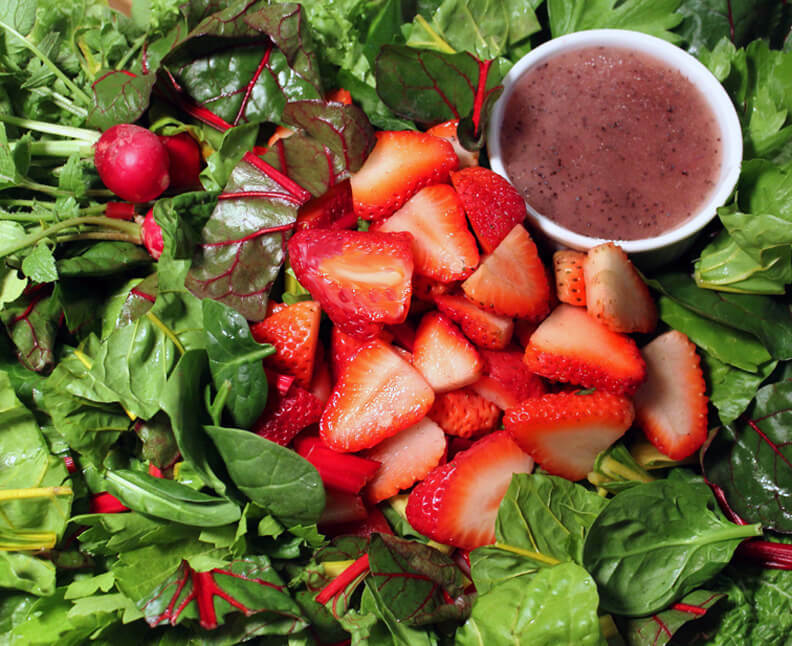 Late March and early April is strawberry season here, and my salad greens are in their prime, so I took D.J.’s chard, mixed them with spinach, curly lettuce and bok choy, topped them with sliced Louisiana strawberries. The dressing is a vinegar and oil emulsion, a half cup each, with something like a quarter cup of honey, a teaspoon of dry mustard, a tablespoon of poppy seeds and salt to taste. Now, you’re going to have to use either a whip and a lot of elbow or a mixer (I can’t recommend a blender for such a small amount) because the seeds will clump. I added a dollop of red wine for color.